(IraqiNews.com) President of Kurdistan Massoud Barzani said on Sunday, that the doors are open for Arabs to fight in the ranks of the Kurdish Peshmerga forces, calling the federal government to do its duty in the liberated areas. 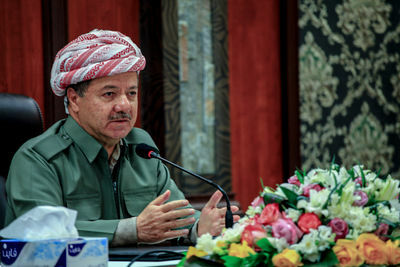 Barzani said during a meeting with Arab tribal elders attended by IraqiNews.com, “The doors are open for Arabs to join the Peshmerga ranks in their fight against terrorism, and without discrimination,” urging the federal government to do its duty and provide services in the liberated areas. 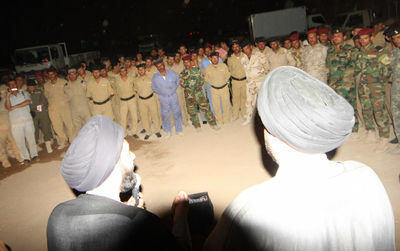 Barzani added, “We should not feed grudges and hatred. 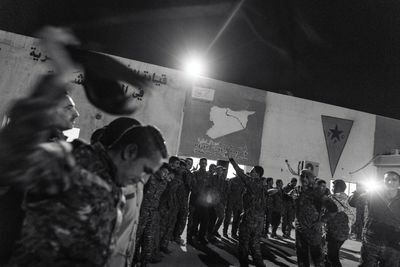 Those who refused loyalty to ISIS must live freely and with dignity, while those who chose to be with ISIS, their fate will be like ISIS’ fate.” “All Kurdish areas have been liberated and are now ready to contribute in the operations to liberate the rest of Iraq,” calling on everyone to cooperate in order to build a spirit of cooperation and brotherhood. Footage from a camera mounted on the helmet of a fighter from the Ali-al-Akbar Shiite militia (part of the larger al-Hashd al-Shaabi umbrella of Shiite militias) shows fighters running through trenches and dirt roads on the outskirts of Al-Awja, the hometown of Saddam Hussein, in southern Tikrit. 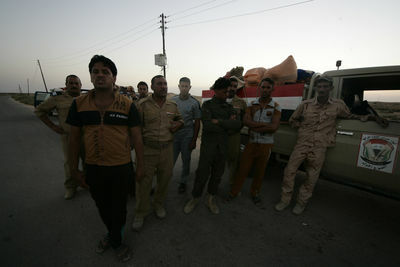 ISIS fighters were forced to retreat following the clashes. 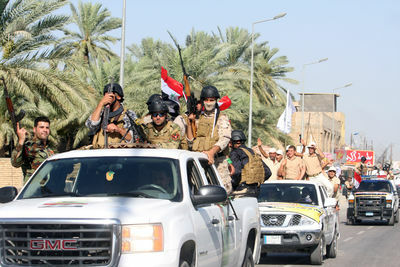 The Iraqi Army, in coordination with al-Hashd al-Shaabi militias, launched an offensive to retake the city of Tikrit, which became an ISIS stronghold in June of 2014. Around 30,000 troops have been deployed and have been retaking villages from the jihadists en route to Tikrit over the last month. Soldiers from the Iraqi Army and the Shiite umbrella group of militias, Hashd al-Shaabi, fire on ISIS positions in the al-Alam area of Tikrit, the birthplace and historical stronghold of Saddam Hussein. The men in this particular video, shot with a camera mounted on one of the fighter's helmets, are from the Ali al-Akbar brigade. Obtained by a Transterra Media contributor embedded with the Iraqi troops, this video shows militiamen advancing toward the battlefield, loading their weapons, taking up positions and firing on ISIS-held bases in the near distance with automatic and rocket-fire. Kurdish and Arab commanders explain the significance of the liberation of the village of Tal Hamis in the broader struggle against ISIS in northeastern Syria. 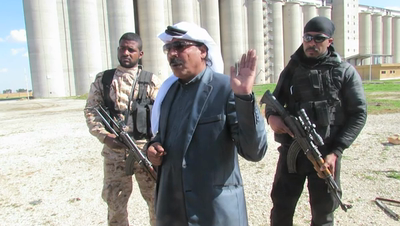 Suleiman al-Shemri, military leader of the Al-Sanadeed forces - themselves the descendants of the Al-Shummar tribe from which various ISIS fighters have been recruited - describes how the three-day battle to liberate the village was in response to pleas from the village's diverse population hailing from various tribal backgrounds. 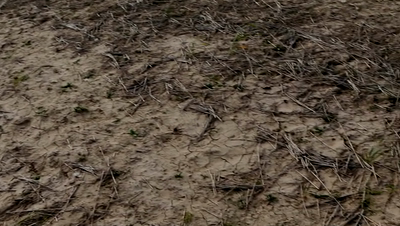 The film also depicts widespread scenes of destruction in a village that, while verdant, has been given over to abandon. Telhamis was a center for the Syrian regime but they relinquished it about two years ago and it fell under the control of those terrorists. Our raid started from more than one angle. We began in the town of Jazaa, which is located on the border of Kurdish Iraq, and from the village of Palestine, until we reached here. People's Protection Units and Women's Protection Units along with several supporting Arab forces were able to liberate areas in order to reach Tel Hamis. Coalition air forces were available but not with the required intensity. The liberated area is very big and even reaches the town of Telbrak. Civilians gradually began returning to their homes and are now free after having suffered under the control of ISIS. We talked to the inhabitants of the liberated villages who confirmed that members of ISIS had seized their property and belongings and evicted them from their homes and villages. At this moment we are going to continue with our raid until we clean the area of members of ISIS, who are now about 30km from Tel Hamis in the area of al-Hol. ISIS placed mines in parts in the village and in cars too. Some of them are still underground and our specialists are working on deactivating them. We have imprisoned many members of ISIS in this raid, and our forces killed dozens of them. We have 30 ISIS corpses. Interviewer: tell us about the raid, who participated in it? And how long did it take to liberate Tel Hamis? Suleiman: The raid began on 21 February 2015 and lasted three days. With the help of God we were able to accomplish our goal. We started this raid as an answer to the request of the population to fight those people who are not related to Islam, based on the request of the inhabitants of Tel Hamis, the people who are the tribes of Sharabeya, Shummar, and Tay. It was based upon their request that we came to Tel Hamis, a center for ISIS. Interviewer: Why is Tel Hamis significant? Suleiman: It is an area that connects Iraq and Syria, a strategic location for ISIS. Interviewer: you, the Al-Sanadeed forces, participated with the YPG in the raid. Who else participated? Suleiman: The participants in the raid were the YPG (People's Protection Units), the Women's Protection Units and the Al-Sanadeed forces. The Al-Sanadeed made up about 1200-1300 fighters in this raid, but the inhabitants also helped us, while the coalition air forces played a significant role. Almost 200 members of ISIS were killed, and we imprisoned others, but do not know the number of captives. The Peshmerga also helped us from the border. Interviewer: How many villages were liberated? How big is the liberated area? 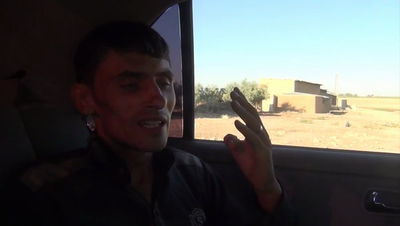 Suleiman: We liberated almost 150 villages in the first few days and up until now have done so in about 200 villages. Interviewer: How far is ISIS now? Suleiman: They are in al-Hol now. 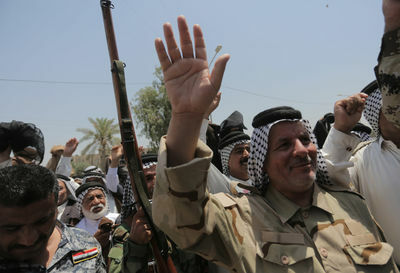 Yesterday the fighters liberated Telbrak, and now we are heading to al-Hol, and then hopefully on to Iraq. People are asking for our help and we are always ready to help people – to fight the enemies of Islam. 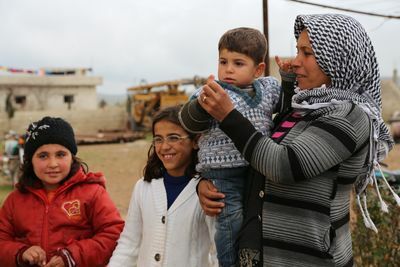 The Rashad Muslim family returns to their village of Qara Maga, east of Kobane, after it was recently recaptured by Kurdish YPG and YPJ forces from ISIS. While the city of Kobane has fallen to Kurdish forces, many of the surrounding villages remain under the control of ISIS and Kurdish forces are now in the midst of campaign capture the villages as well. The amount of IEDs left by the Islamic State is staggering. 'Not normal', says the mayor of Makhmour. According to Kurdish government and Peshmerga officials, improvised explosive devices (IEDs) and mines planted by Islamic State militants are the biggest cause of casualties for Peshmerga forces. ISIS has adopted the tactic of heavily seeding all of the territory it withdraws from with the deadly devices, with the intent of slowing down Peshmerga advances. 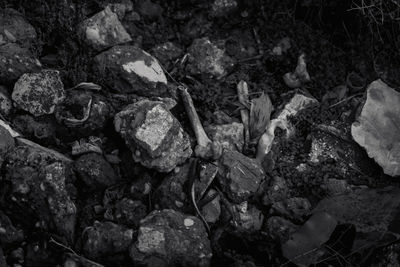 Some IEDs are also intentionally left in fields and homes to target civilians according to Kurdish officials. 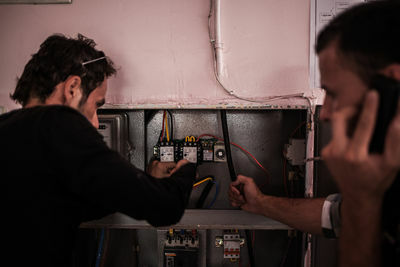 We go to the frontlines with a Peshmerga engineer team specialized in dismantling the devices, and speak to a farmer who is affected by Islamic State IEDs. The mayor of the city of Makhmour, whose community is still dealing with getting rid of massive amounts of IEDs ISIS left in August, also weighs in on the subject. 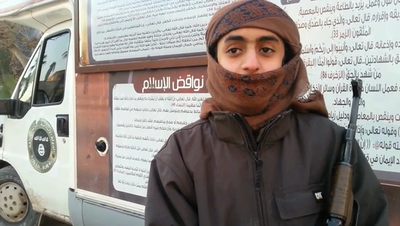 Interview with ISIS Fighter Abou Al Hatoun from Saudi Arabia on January 22nd 2015 in Raqqa, Syria. As IS continues its campaign of beheading and torture of its opponents and captives, many Kurdish Peshmerga fighters have made an oath never to be captured alive by IS forces. Some fighters now keep a suicide bullet for themselves to be used if they are about to be captured. 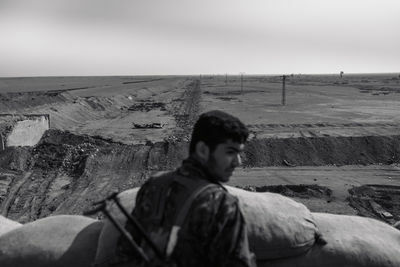 This story explores the issue of suicide on the Kurdish frontlines of the battle against IS. 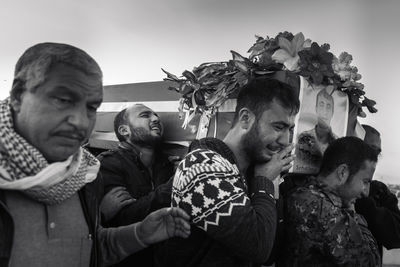 While suicide is strictly forbidden in both Islam and Christianity, many Kurdish fighters feel it is better to take one's own life than be subject to what they fear would be a brutal, merciless captivity and death at the hands of IS. Those interviewed say that the perceived brutality of IS obliges them to reconsider traditional attitudes to suicide. 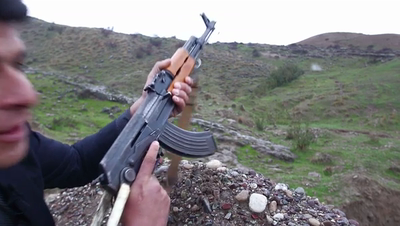 Interviewees include two peshmerga fighters who both had their own close brushes with death whilst fighting IS. The first one is a hunter experienced in killing wolves and small game who brags that killing ISIS fighters is easier than shooting rabbits. The second one was wounded in battle with IS and is now recovering at home. His father is also interviewed and explains that he always tells his son to fight to the death against IS. Both fighters finish their interviews by explaining why suicide is preferable to capture. Next, an imam explains the Koranic rules on suicide. Suicide is forbidden in Islam, but God might be more lenient on those who kill themselves in battle. 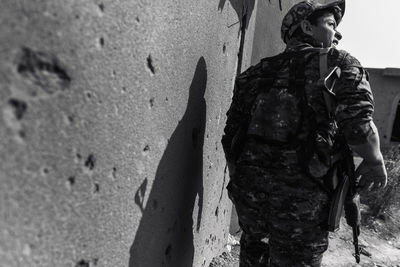 Finally we interview two fighters on the frontline. 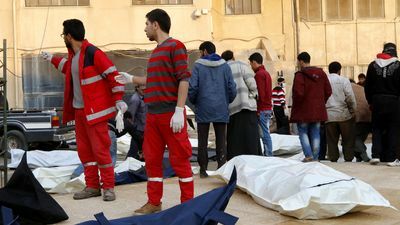 At least 95 people were killed and 120 injured on Tuesday in a series of airstrikes believed to be carried out by Syrian government forces against civilian neighborhoods in Raqqa, according to the Syrian Observatory for Human Rights. The airstrikes caused large scale devastation in residential buildings and public squares. A mosque and the local museum were also damaged in the bombing. 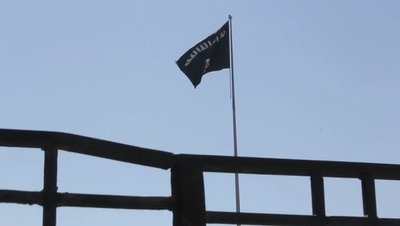 Raqqa is the self-proclaimed capital of the Islamic State group, also known as ISIS. An international coalition led by the United States has launched a bombing campaign against ISIS positions since September. Eyewitnesses, however, believe that these airstrikes were carried out by the Syrian government’s air force. During the days of terror on Mount Sinjar, about 200 women were kidnapped by the militias of the Islamic State to be converted to Islam and sold in the occupied cities of Mosul and Tal Afar. This barbarism is not new to the chronicles of war. 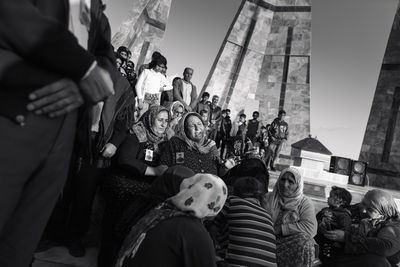 The Islamic State's attack on Mount Sinjar led to the exodus of about 500,000 people, mostly from the Christian, Yazidi and Shabak minorities. 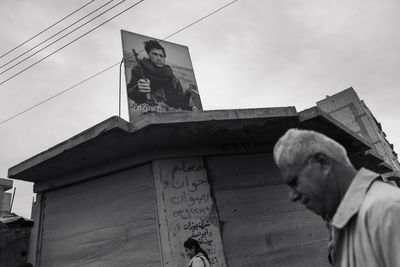 These refugees, currently under the protection of the Kurdish militias, are living in the streets, under bridges or in abandoned places in Erbil and surrounding villages. Many of those who manage to escape the conflict have suffered losses in their family that effect them not only economically, but mentally and emotionally. Depression and anxiety in addition to insecurity are a constant challenge. The UNHCR anticipated there to be over 900,000 internally displaced people in Iraq by the end of 2014. With the rise of ISIS, that number has been more than tripled, with 2.9 million displaced according to International Displacement Monitoring Center. The situation of internally displaced women, not only in Iraq but in conflict zones around the world, is especially precarious as the breakdown in social structures is a risk factor for gender-based violence. In their planning document for 2014, the UNHCR says it is ramping up its efforts to protect refugee and internally displaced women. However, agencies like the UNHCR as well as local associations can only care for and provide aid to so many displaced people, leaving others to fend for themselves. The condition of the women and children displaced in Iraq is tragic: not only from a material point of view, but also from a psychological and ethical perspective. While talking with them, the elderly were crying because they don't see a future for their land, culture or traditions and were continuously asking, "What did we do wrong to deserve to be killed?" The women were mostly passive, trapped between emotions, tears, the inability to react, “deafened by pain and suffering.” They seemed to understand that as time passes by, the hope of returning to a normal and fair life fades away. 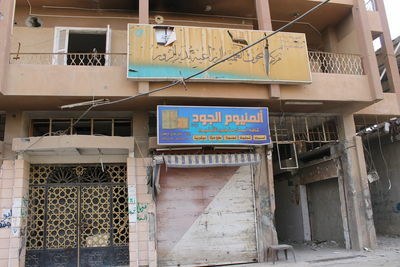 Photos show the abandoned headquarters of ISIS on al-Intilak st. in central Deir Ez Zour. The militants left the building, which was originally used by a consumer organization known as al-Qabban, for fear of them being targeted by international air strikes. However, ISIS still has control over the city and their religious police drive around the area enforcing sharia law by monitoring dress codes, making sure shops are closed at prayer times, and enforcing a smoking ban, among other things. The video also shows a former research center also used by IS and now abandoned. 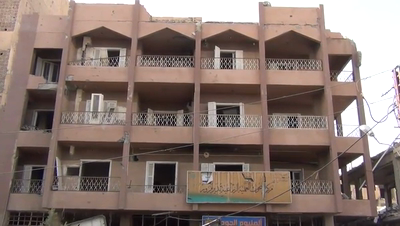 Video shows the abandoned headquarters of ISIS on al-Intilak st. in central Deir Ez Zour. The militants left the building, which was originally used by a consumer organization known as al-Qabban, for fear of them being targeted by Western air strikes. However, ISIS still has control over the city and their religious police drive around the area enforcing sharia law by monitoring dress codes, making sure shops are closed at prayer times, and enforcing a smoking ban, among other things. The video also shows a former research center also used by IS and now abandoned. 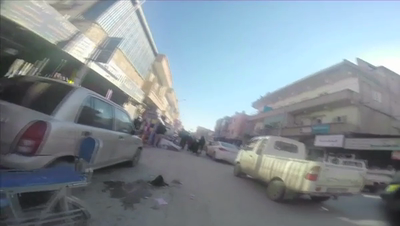 Footage of ISIS car (al-Hisba) making rounds in al-Takaya street, telling people how to commit to the Shari'a. Islamic State fighters collect the debris of an unmanned aerial vehicle (drone) that collided with a telecommunications tower in Clock Square in Raqqa. 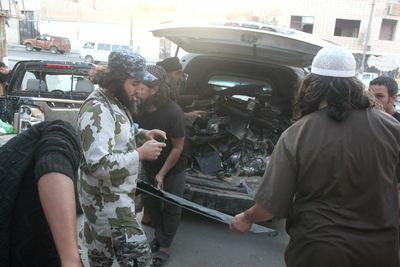 Photos show fighters putting the debris into the back of a van. Citizens in IS held Deir Ez Zour discuss the impending US strikes. Included are vox pops with a local woman and an IS fighter. "What is your opinion concerning the international air strikes and the countries contributing in the strikes?" Jamal: "It will have a negative effect on the Arabs and the Islamic state, we are an Islamic state built on the basis of Quran and Sunna, so if the strikes were from the west, they will rise problems for the Islamic state." Interviewer: How is your spirit and your preparations? Jamal: "Our spirit is positive and we are insisting to deliver our message and we do not doubt the abilities of the fighters." Interviewer: "Is there a fear that the Islamic State will lose some of the areas it controls after the strike?" Jamal: "We do not fear this movement, it is a zionist movement against the Islamic State. We do not approve of this issue because we are Muslims." Interviewer: "How do you see the balance of power after 40 countries have announced that they will contribute in the air strikes?" Jamal: "The power we have is the support of God, no power exceeds the power of God. We insist on this method, the method of Islam." "There will be battles, and those air strikes will not change anything. My opinion is that those air strikes will not affect us at all." "America remains the enemy of Islam and Muslims, and those who support America is the enemy of Islam and Muslims. All Muslims are against those strikes and we will stand against them." Interviewer: "How is your spirit and preparations?" Abu Mohammad: "Well our spirit is very positive because we have the support of God and he will help the Muslims win. He will help our brothers in the Islamic State." Interviewer: "Do you fear that the Islamic state will stop expanding after the strikes?" Abu Mohammad: "I do not think so, they have a very positive spirit. When we sit with some of the brothers we notice their positive spirit and their commitment to expand." Interviewer: "How do you see the balance of powers since over 40 countries agreed to contribute in the strike?" 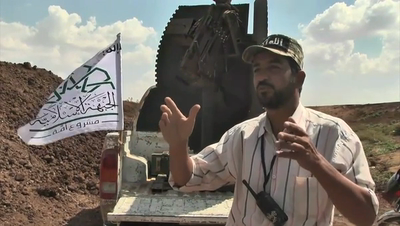 Abu Mohammad: "They have the power when it comes to planes, but on the ground they cannot beat our fighters. God will help them." Interviewer: "What is your opinion about the international strikes against the Islamic state, and the countries that are contributing [to the strikes]?" Mohammad: "My Muslim brother, concerning the upcoming American strikes and the Jewish liberal western alliance that is happening against the Islamic state, we do care about the name, we talk about this concerning the Shari'a. The Shari'a of god will be applied literally, we are not applying it literally now, but hopefully we will reach a point where we will. As for the people participating with the infidels in fighting the Islamic State, those Arab presidents, those dictators fight any person who tries to apply the Shari'a of God. Any person who helps the infidels fight the Muslims is the biggest infidel. Those are the word of Sheikh Salman Bin Fahed al-Alwan, may God release him from the prisons of the Saudi family." Interviewer: "How is the preparation for the strikes?" Mohammad: "We have God on our side. They have the infidels and we have God." Interviewer: "Do you fear that the Islamic state might lose some of the areas it controls after the strikes?" Mohammad: "God is supporting us to stay on this land. We know that Islam is fought by everyone and anyone who tries to apply the Shari's is fought, but God will help us win." Interviewer: "How do you see the balance of power since over 40 countries agreed to contribute to the strike?" Mohammad: "This is very similar to the previous question, I already told you, we have God supporting us. If all the countries in the world cooperate against the Islamic State, and God wants us to win, we will win. God will help us win, and stay, and apply the Shari'a. Those who have the support of God fear nobody." Interviewer: "What is your opinion concerning the international air strikes and the countries contributing to the strikes?" "We all know that those air strikes are against Sunni Muslims. They tried to cover it by saying that they are striking against the extremist groups, but it is only against the Sunni groups. And now America is afraid of the Muslims because they are getting stronger and that is why it is trying to destroy us." Interviewer: "How are you, as doctors and civilians, preparing for the strike?" Abu Yaakoub: "We have been preparing for over three years against any strike despite of our humble abilities. We are prepared against a strike, we knew people are going to interfere to protect Bashar and his followers and to protect the Shia. We were able to stand against all the attacks we have been facing for the past three years. We have had barrel bombs dropped on us, we have been attacked so many times and we survived. Bashar was not fighting us alone, he had many by his side, we were fighting half of the world and now the whole world is fighting us and we are ready." Abu Yaakoub: "We know that God will be on the side of the righteous people, and if the Islamic state is right, then nothing they will do can harm us. We know for sure that victory is meant for the Sunnis and we are meant to go back to the Islamic caliphate, just like the Era of prophet Mohammad. If anything, we expect the strike to bring us close together and the concept of the Islamic state will expand to all of the Levant and hopefully Mesopotamia." Interviewer: "How do you see the balance of power now that over 40 countries agreed to contribute to the strike?" Abu Yaakoub: "We are convinced that if the whole world came together to destroy the people of the prophet Mohammad, they will not be able to. They will never be able to destroy the people of Mohammad, we are staying until judgment day." Interviewer: "How is the spirit and the preparations?" Um Sabri: "Thank God we are preparing very well because, for the past three years, we have been receiving strikes from Bashar al-Assad." Interviewer: "What is your opinion about the American strikes and the countries that are contributing to the air strikes considering a lot of them are Arab countries?Um Sabri: I believe the air strikes are not against what they call ISIS which is the Islamic state, it is against the Syrians who proved to the world their strength with their amazing revolution, and to defend Bashar al-Assad." Interviewer: "How are the civilians preparing?" Um Sabri: "This question is very late, they should have asked how we prepare for the strikes of Bashar al-Assad. The American strikes, along with the 40 countries, are not going to be tougher than the strikes of Bashar al-Assad. So, thank God, the days have proven that we are ready for any strike from the infidels." Interviewer: "Is there a fear that the American strikes might slow down the expansion of the Islamic state?" Um Sabri: "That is up to the strength of belief in this organization. If they are right, God will help them, and if they were wrong, God will take care of them." Interviewer: "How do you see the balance of power when there are over 40 countries contributing in the strike?" Um Sabri: "There is no balance in power between the Islamic State and those big countries who have the contribution of 40 countries, some of which are Arabs. Definitely there is no balance in powers, but victory comes from God." Interviewer: "What is your opinion about the international strikes against the Islamic state, and the countries that are contributing?" Man: "Those are infidels, Americans are infidels and those who support them are infidels. The Islamic State will remain with the help of God." Interviewer: How are the Spirit and the preparations? Man: "We are ready for anything." Man: "The Islamic state will remain with the help of God, we want religion, and with the help of God we will stay and expand." Man: "They are infidels, the Islamic state will remain. Infidels have banded together to fight the Muslims throughout history, but we will remain with the help of God." IS fighters and civilians collect the debris from a drone that crashed into a telecommunications tower in Clock Square, in central Raqqa. The origin of the drone is yet to be identified. "We were able to take down an American jet the first time one flew over Raqqa." "Thank God an American jet was shot down. When they hit the telecommunication tower, they lost control. This is a joy for the Muslims and proof that God is by our side and our state will remain." "They keep saying they have jets and they have weapons, but we have fighters who love death as much as they love life. The sky is owned by God and so is the land, and he will give it to who God wants. The drone hit the telecommunication tower and crashed." "We woke up to the sound of explosions in the early morning, and the shelling continued between 3-4 am. I then came here to find that drone had crashed after it hit the telecommunication tower." "At 5am, a drone hit the telecommunication tower in Raqqa city. So we came and found the pieces in the streets, why are they doing this, we are Muslims." "At 4am we woke up to the sound of explosion after a drone hit the telecommunication tower in Raqqa. The pieces of the plane were spread across the city." "A drone crashed after it hit a telecommunications tower in Raqqa at 4 am. We tell America, we are not afraid." In the lead up to possible American strikes in Syria, the Free Syrian Army has launched a renewed offensive against ISIS in northern Aleppo province. The FSA frontier extends for 70 KM from the town of Shaeer, in the south, to the Syrian-Turkish border in the north. Managed by Nahrawan al-Sham operation room, the FSA is using many light to heavy weaponry distributed along the frontier. ISIS is taking advantage of the gathering of FSA fighters to attack them with car bombs. This has forced the FSA to increase road blocks and searching points. The two sides continue to attack each other, as they have been for the past two months. “We are now attacking ISIS locations from a 2400m distance with a locally made 90mm mortar. Thank God, we have a strong spirit and we are very motivated in the operation room”. “We are now stationed in one of the attacking frontiers against ISIS. We are a part of the fighting groups located on the frontier, we are on the first line with ISIS. We are all one and we are all cooperating and working under the orders of the operation room. Throughout the night, many conflicts happen and, in the upcoming few days, there will be movement”. “We are stationed and prepared to fight ISIS, we are working under one operation room and any move ISIS makes we will be ready to attack with mortars and heavy weaponry. The distance between us and them is 700 meters”. 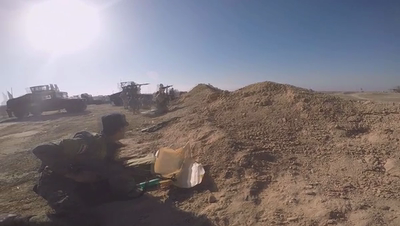 Various shots of the fighters preparing the mortar to attack ISIS locations. A shot of a locally made 90mm mortar firing towards ISIS locations. Various shots of the fighters on the frontier where they fight ISIS. 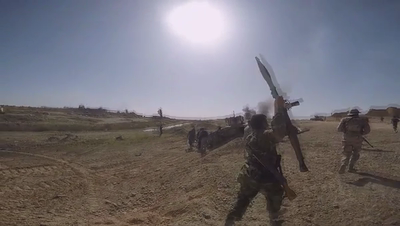 Various shots of the FSA fighters aiming at ISIS with heavy weaponry. A wounded Hezbollah fighter, fresh from battle against IS in Syria, gives an exclusive interview discussing the state of Hezbollah in Syria, the battle against IS and Nusra, his opinion about the American strikes against IS, and Hezbollah's readiness for a new war with Israel. The fighter who was recently wounded in battle against IS and Nusra in the Qalamoun mountains describes human wave attacks by IS and Nusra and the military logistics of Hezbollah's fight in Syria. 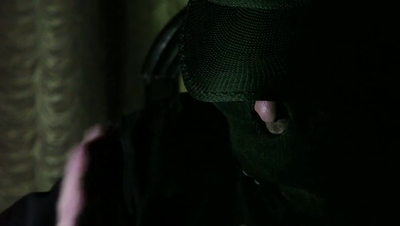 The fighter's voice has been altered to protect his identity. Q: Can you give us your code name? A: My name is Hussein. Q: We know that you were recently on a frontline, and you were injured, and you just returned [home]. If it is not confidential, can you tell us which frontline you were on? Q: People hear that there are battles in Qalamoun, but of course as a person on the frontline, you know more. Tell us who you are fighting in Qalamoun. Who is the enemy in Qalamoun? A: Jabhat Al Nusra, ISIS, of course half of them are foreigners: Saudis, Kuwaitis, Afghanis, Lebanese. It is a mix. Q: Do you have an idea about how many [ISIS/Nusra] fighters there are? A: There are around 12,000 to 7,000, and they are constantly increasing in number. Q: So there is still an influx [of Nusra/ISIS fighters] from Syria? A: Yes, the majority are coming from Arsal, even though this [route] is now supposed to have been controlled [by the Lebanese Armed Forces], the influx from Arsal. Q: From your close quarters engagement and fighting with them, how trained are they? A: They have high capabilities, but their way of attacking, they come in huge numbers. For example, and this is causing us some losses, if we have a position that can withstand the attack of a 100 fighters, you would find 600 fighters attacking us, and this is causing losses for us. A: Like our weapons. Cornets, 23mm guns, 14.5 mm guns, 57mm guns, grad rockets, of course they are using grad rockets. [They use] traditional battle weapons. They have canons, mortars, and rockets. They mostly rely on snipers. When they initiate an attack, they would have around 100 snipers spotting and providing covering fire. So the battles are very hard. Q: Is The Resistance [Hezbollah] getting any military support from the Syrian Army? A: Some air support, but while fighting [on the ground], there is not supposed to be any Syrian army members. Q: When your group is fighting, are the orders coming from The Resistance or the Syrian army? A: For The Resistance, the orders 100% from The Resistance. The leadership is from The Resistance. The orders come from the The Resistance’s group commanders. There is a field commander, there is a military commander on the ground, and there is a commander higher than him in the operations room. The Resistance only. Sometimes if we need anything from the Syrian army, we give them the coordinates and they hit the location [from the air]. Q: How intertwined are the front lines [between ISIS/Nusra and Hezbollah]? A: Very intertwined. There can be areas where there is 500m distance between us, sometimes 300m, or 200m. You may get surprised by them in some areas. At times they may not be prepared for us and we launch a surprise attack on them. We do infiltration operations and use explosive charges. And spotting is constant, naturally; we know who we want. Q: What do you remember from the day you were injured? A: They launched a massive attack on us. Some men with us were martyred, and some were wounded. Then we our backup arrived. When the injury happened, I was still able to fight until the medics came and we fixed the situation. I stayed on the ground for a while until more [Hezbollah] groups came and helped us. Then the medics evacuated us. That is all I remember from the battle, but it was a massive attack. You have to consider they were around 2000 members. This is how they attack, they come in waves and they don’t let you rest. Attack after attack, attack after attack, attack after attack. And they don’t care how many of their men die; those [Nusra/ISIS] fighters who flee the battle get killed [by their commanders] when they return [to their base]. Q: What did you feel when you were wounded? What was the first thought to go through your head? Did you know how serious your injury was? What did you feel? A: I felt some pain. When I first was wounded, I did not feel anything, but the hit was hot. Then it became harsh. After 15 minutes, I was not able to move properly, so I became still and I said the Shahada [a mantra used to declare one’s faith in Islam]. This [martyrdom/death] is the reason we are coming here. Q: Where were you injured? Q: Was it mortar shrapnel or a bullet? A: No, it was an M16 bullet. A sniper. Q: How do you perceive the “Takfiri” [Extremist] enemy in front of you? A: I perceive him as the enemy of all humanity, and fighting him is a duty. Q: Do you feel that there is a possibility of negotiating with these “Takfiri” groups, or with Free Syrian Army groups, if there are any left? A: With the Free Syrian Army, maybe at some point. However, with Jabhat Al Nusra, and ISIS in particular, there is no possibility. No possibility at all. Q: Is this a battle until the end? A: It is a battle until the end and we are with fighting them in Lebanon before they spread. Q: How long are you staying here to rest? A: For now, I will stay here for no less than 2 months to recover. I cannot go back [to the frontline] before 2 months. Q: Are you excited about going back to the frontline? Q: Can you give me an estimated number of The Resistance fighters? A: The thing with The Resistance is that I cannot give you a number. Each unit knows what it has. For example, I do not know what there is in another unit. In Hezbollah, each team is on its own, each unit on its own. One unit does not know what the other unit has. But I can tell you that we have our weight up [in Syria] and that we have not forgotten Israel. Q: In your opinion, is Hezbollah ready for a two front war? A: The amount of men fighting [on the Israeli front] has not doubled, but tripled the amount who were fighting in the July War [2006 War with Israel]. They [the fighters on the Israeli front] do not know what is going on in Syria, their job is there [on the Israeli front]. Q: So they [the fighters] are separated? Q: How ready is The Resistance? A: Since 2006 until now, The Resistance has always been ready and is ready for any war at any time, and on all fronts. Q: Did any of your comrades get martyred while you were near them? Q: Can you tell us about an incident? A: A man [Hezbollah fighter] was martyred, and he was telling me, “send my regards to my mother, this is how I was martyred”. I told him not to be afraid and I comforted him, but the bombardment was very heavy. I moved him to another place and we waited with him until the aid came, but he was already martyred. And of course I sent his regards to his mother and I gave her his scarf with his blood. Q: When one of the men with you gets martyred, do you feel that this encourages the rest to fight or does it cause some sort of frustration? A: Our resolve is always strong for a simple reason. No one hit me on my hand to become a fighter. I feel am threatened here in Lebanon. We are seeing what is happening in Iraq, we saw what happened in Syria. These people have no mercy for anyone. No one is forcing us to go fight. On the contrary, there are many who are told to stay here because there is no need for them to go fight. I can assure you that if the Sayyed [Hassan Nasrallah] calls for a war, we will have 300,000 fighters in a matter of hours. Q: Is there any place where you wish things were better? Logistically or artillery wise, or maybe more orders? A: We are doing what we are capable of doing. On the contrary, we have the best food, the best weapons, the best training and the best morale. We know who we are fighting. We know that we have no blood on our hands, we are exonerated in this world from that. We have no problems from that aspect and we are very comfortable. The more blood we lose, the stronger we get. Q: We heard recently that an international alliance was born to attack ISIS targets. In your opinion, can we consider Hezbollah and the United States as having an intersection of interests? A: There is no intersection at all. ISIS is a creation of America. Israel made ISIS to get to where we are now and they were not able to succeed. I think this is another link in the July War [2006 War with Israel] chain, and God willing, we will break it. Q: If there is a message you would like to tell the people listening to you, what message would you like to send? A: We are victorious, as God is one, and I would like to reassure [our solidarity with] all of humanity and all of its sects. For ISIS, all sects are its enemies, even the Sunni. Anyone who saw what is going on in Iraq, in Mosul, how they are walking the streets, shooting people right and left, without knowing their identity or nationality or to which sect they belong. All they do is kill and destroy, and it is a duty to fight them. We will win and God will make us victorious because we are right. A Hezbollah commander, fresh from battle against IS in Syria, gives an exclusive interview discussing the state of Hezbollah in Syria, the battle against IS and Nusra, his opinion about American strikes against IS, and Hezbollah's readiness for a new war with Israel. The commander discusses details about battlefield issues and difficulties. He also declares that he "hopes for a war to start between the Zionist enemy and Hezbollah soon", and that he has "no problem with the American people," but does have "a problem with American policies." The commander's voice has been altered to protect his identity. A: In the name of God, the merciful. My name is Jaafar, I am a member of Hezbollah. Q: Please tell us about the amount of people signing up to fight with Hezbollah? A: Thank God, volunteers are coming in on a regular basis. It [enrollment] has increased after the war in Syria and the 2006 war. [It increased] Especially after the Syrian war because it is known and in the open now. They [Syrian opposition] want The Resistance’ head, Hezbollah’s head. You are probably seeing the events and measures being taken by media outlets [to fight Hezbollah], or even the nature of movements on the ground are affecting [fighting] Hezbollah. Hezbollah gains strength from the blood of the martyrs. This is a grace from God and we are thankful for that. Q: In the recent battles, in Arsal and Qalamoun, it is obvious that Hezbollah is taking casualties. How big are these casualties in comparison to those suffered by the ‘Takfiri’ [extremist] groups? A: Specify what you mean by casualties. Human casualties? There are no human casualties. There are martyrs and wounded people, not casualties. If you are talking about materials losses we might agree with you, but if you are talking about people, we have martyrs and wounded men, not casualties. These people are fueling this cause and this march, our martyrs in who we take pride. Material losses are the casualties that we can agree with you on. Q: How can we compare martyrs and wounded of Hezbollah to the casualties among the ‘Takfiri’ [extremist] groups? A: We in Hezbollah do not hide any martyrs and this is not in our traditions. When a Hezbollah fighter is killed, he is buried on the second, third, fourth or first day, depending on the battlefield and the moving of the body, and when his parents wish to bury him in his hometown. Nothing more. You need to see the other side, they are not organized. Everyone works according to their own thoughts or according to those financing them. As for Jabhat Al Nusra, who are the terrorist group with the biggest presence on the border between us and Syria, I don’t believe that they talk about their casualties. As for our intelligence and security services, we always give them accurate accounts in names and numbers, if you have noticed, while they [Jabhat al-Nusra], on the other hand, do not announce [their casualties] until a while after they have been killed. This is the difference between them and us. Q: What is the level of Hezbollah’s readiness at this point in time regarding the danger of a war on both the eastern front [Syria] and southern front [Israel] simultaneously? operations of the young men fighting on the eastern Lebanese-Syrian borders is entirely unrelated to the battles with the Israeli enemy, and anyone who thinks otherwise is delusional. Q: So if we need to know a percentage of readiness? A: With Israel? More than 100%, and this is the case all of the time. You can even label it as ‘holy’. Regarding the situation in the whole of Lebanon, Hezbollah is completely ready in all areas that Hezbollah has influence. We have nothing to do with areas where Hezbollah hold no influence. Q: Now that you’ve mentioned this, we have heard news that Hezbollah is helping, either through training or arming, some parties in the Christian border towns. How accurate is that? Q: Can you please clarify? What did he confirm? What did he say? A: He confirmed that Hezbollah is protecting Christians with all possible means. For those who want to defend themselves with their own hands and weapons, Hezbollah is providing them with the means to be ready, which includes arming individuals. Q: How many Christians are actually signing up for this? A: I have heard that 90% of [Christian] villages… and the Lebanese Forces [political party] and the Phalange Party are not happy with that because no one is providing them with any support. Q: In the Qalamoun and Arsal fronts, to be specific, who is Hezbollah fighting against? A: 83 countries, all of them. Those who were fighting us in Qusair are now fighting us in the outskirts of Arsal, that is the mountainous area outside Arsal. Not inside Arsal, we are present in the mountains defending our land, country and Resistance. We will be where we should be. There are many nationalities: Uzbeks, Chechens, Egyptians, Palestinians, all of the gulf and Arab countries. We have 83 countries operating against us: the Europeans, Americans, British, you name it. God willing we will be victorious. Q: Since you have mentioned the Americans, we are hearing that American and other airstrikes against ISIS are already underway. Can we say that there is a temporary intersection of interests between Hezbollah and the United States? A: If I were to answer you about the Americans and their ISIS allies, we would be wasting time. You are a politician and a journalist and you understand these things, so us talking about this would be like us making fools out of each other. They (ISIS and the US) are allies and one team, period. Q: If we were to give a description of the nature of the struggle now, the Americans are now bombing some ISIS positions and Hezbollah is fighting against ISIS and other groups. A: When we fought ISIS, Nusra and terrorism everybody stood against us. Now everyone is saying what we were saying, but there is a difference in dealing with it. Hezbollah started two and a half years ago. They should come to us and strike an alliance with us. Isn’t that right? We are way ahead of all of them. Q: In your opinion are these airstrikes and this alliance a pretext or a prelude to bomb some (Syrian) regime positions in Syria? A: You need to see what is being prepared internationally. It will not be long. All will be clear in a matter of days. I do not have accurate information about this subject and I am not a political analyst. I can tell you about the nature of the terrain and soldiers. The geography of the battlefield, or what took place in this position or that. However, to talk about something international that I am not familiar with would be beyond me. Q: Can you please tell us, without revealing any secrets, where is Hezbollah present on the ground in Syria? A: I can answer about the areas that I was present in. The Sayyida Zeinab shrine [in Damascus], Ghouta [Damascus], Jobar [Damascus], the Damascus suburbs, and the mountains separating Lebanon and Syria. There is a Hezbollah presence in all of these areas. Qusair and the outskirts of Qusair. Aleppo. I have some friends who operate in Aleppo, in an area called Zahra, which has been under siege for three years. I have not heard of, seen, or been to other places. Q: What is the nature of the frontlines in these places? Can we briefly talk about every front and how intertwined the lines are [with Nusra/ISIS/FSA]? How close is the engagement with the enemy? A: This depends on the geography and terrain. In some places it’s house-to-house, window-to-window, man-to-man, and on some fronts, no one advances, neither them nor us. In the wider, more open areas, the snipers use 23mm and 57mm guns, not the Dushka or the12.7mm guns [because of the large distances]. Imagine that. The distances are vast. Every terrain has it’s own circumstances, geography and weaponry. There are some mountainous areas with rough terrain that have their own style because you can’t hide from each other at close range. You need to secure a hilltop and fortify it [and advance from] from one hilltop to another or one mountain to another. This is not house-to-house, so the nature of terrain makes a big difference. Q: Was there a certain front that proved to be more difficult than others? A: in terms of terrain or combat? A: The mountains. There are vast distances beyond what the eye can see. This doesn’t offer the same help you get in towns like Qusair. This requires more troops and heavier weapons, aerial bombardment, artillery and tank fire. It has it’s own style and takes more time. Q: Since you have mentioned aerial bombardment, what is the extent of coordination between Hezbollah and the Syrian army when it comes to military operations? A: This is up to the leadership of Hezbollah. We have 100% accuracy when it comes to targeting. The targets that we request the Syrian air force to bomb are hit with 100% accuracy. Not 75% or 50% like it used to be before. This has changed after the battle of Qusair. This is what I can help you with. There were mistakes before, I won’t deny it, it happened with a number of groups. However, this stopped after Qusair. Q: On the ground, in the areas where Hezbollah is present alongside the Syrian army, who has command on these fronts? A: We do not participate in any attacks alongside the Syrian regime. The Syrian Army handles one front and we handle another. We deal with ours and they deal with theirs. Sometimes, this hasn’t happened to me, the Hezbollah and Syrian Arab Army forces are engaged and intertwined. However, in the fights that I was involved with in Hezbollah, we were in one place and the Syrian Arab Army was in another. Yes there exists coordination, but the lines are not intertwined. Q: So in this case who is in command? A: When you [Hezbollah] are on a certain front and they [the Syrian Army] are on another front, the field commander [of each side] has command, but the coordination is present so that we wouldn’t shell each other with artillery. Q: We heard on Israeli Media that threats were being made against Lebanon and that there were preparations for war. In your opinion, how serious is this? And how will The Resistance [Hezbollah] retaliate? And what is their level of readiness? A: We in The Resistance do not take the words of the Zionist enemy lightly. We have political and military minds and analysts who observe and analyze, in depth, on the short and long run when it comes to the Zionist enemy. This is due to wise leadership headed by the secretary general Sayyed Hassan Nasrallah. Q: So you take the threats seriously? A: We do not neglect anything regarding the Zionists, even if it were a small or big thing. All gets dealt with seriously and meticulously. A: This is what we hope for. Q: Can you please give me a complete answer because my question will not be aired? A: This is what Hezbollah hopes for, for a war to start between the Zionist enemy and Hezbollah soon, God willing. This is what we hope for. This is what every member of Hezbollah hopes for. Q: Can we say that The Resistance is fully ready? A: Of course, you can say that with the utmost confidence. Q: Tell us about a certain incident that will allow me to illustrate the influx of volunteers joining Hezbollah’s ranks. Do you recall a certain incident? A: In what respect? Be more specific. Q: In terms of influx and people wanting to join. A: This is an ongoing process in Hezbollah. This [Hezbollah] is a school [of resistance] ever since they [Israelis] occupied our land in south Lebanon and Hezbollah, thanks to God and the young men, is growing in numbers. Hezbollah never deteriorated. For 30 or 32 years, since 1982, Hezbollah is on the rise, and thanks to the almighty God, whoever fights Hezbollah falls, declines and perishes. God willing, and the biggest proof of that is the Israeli withdrawal and the blows that were delivered to the Takfiris [Extremists] in Syria. We are continuing, God willing. This is a universal war against us and we are all-in. Q: What do you say to some media outlets who are saying that Hezbollah and the Americans are now allies? A: We are not even remotely concerned with these outlets. We never relied on those media outlets that you are asking about, nor on human rights or the United Nations charter. We do not care about all that. We rely first on God and then ourselves. Q: So can you tell me if Hezbollah and the Americans are allies? A: Your question is out of place. Q: it is out of place because you and I know each other. A: This is my opinion and my doctrine. This is all I can answer. We do not have a problem with the American people; we have a problem with American policies. Take a look at American policies in the Middle East and the world, from the times of Hiroshima until this day, and you will know if Hezbollah is with it or against it. We will let the viewers decide that. Q: Is there a certain message that you would like to send to an audience that might be Arabic or western that will be viewing this interview? A: We rely on people’s intelligence and awareness. [We do not rely on] People who are bought with money or intimidated by force or the media. There are honest people who take to the streets carrying the banners of resistance from Hamas to Hezbollah to the Islamic Jihad. These people and this resistance will never die. These people are there, but their rulers are corrupt. The people are present, just give them some hope of being able to express their opinions freely and they will do just that. They are entirely with us. Q: There is a question that I forgot to ask at the beginning. Through your engagement with Takfiri [Extremist] groups, what can you say about the level of their training and arming? A: They are being armed by all countries and their training comes from places as ranging from Turkey to Chechnya, to Iraq, the Balkans and Somalia. All of the areas where Al Qaeda and Wahhabis are active, from Yugoslavia, to Bosnia, and Serbia. Those who have not fought in these places are being trained in Turkey and Jordan, and in Saudi Arabia, according to some information. We are fighting 83 countries and an influx of money and media outlets and weapons and hundreds of thousands of fighters, but it is very well known where the Banner of God and his prophet lay. It lies with the just cause. Q: Do you, as a person and as a Hezbollah fighter, have any fears that, after the upcoming airstrikes against ISIS, extremist fighters will spillover into Lebanon? A: God willing, we are waiting for them. They are attacking civilians, children, old people and women. Our fight with the Takfiris [Extremists] is in the battlefield, not in the different media outlets. We are in the field. If they want to fight Hezbollah, let them leave the civilians out of this and, if they are men as they claim, we are here. Let them come face us. We don’t kidnap or cut throats, we fight. The prisoner we take is a prisoner of war, while they cut throats of prisoners and wounded. Q: Since you mentioned prisoners, it is no secret that Hezbollah has taken prisoners from these groups. A: That is possible. I can neither confirm nor deny that. It is possible. Q: I want to ask you about how you treat the prisoners you take from these groups, if you have taken any prisoners. Syrian refugees dodge Turkish Army patrols as they are smuggled from Syria to Turkey. Smuggling has become increasingly difficult as many smugglers are being beaten up or killed by Turkish soldiers. However, there is no other ways to escape Syria, despite the existence of four legal crossings in the area. "People here want to cross to Turkey. We are in Syria and, as you can see, we have these people who want to get to Turkey. People are dying here, sometimes there is shooting. The road from here is very difficult. On the IS side of the border [Islamic State controlled area], the road is open, but only for Arabs. On the Kurdistan [Syrian-Kurdish controlled] side, the road is blocked by the Kurds. People here have injured relatives and they are working so hard to be able to afford to eat. Life is very hard here and people are forced to leave. We are trying to smuggle these people into Turkey and it is very hard. 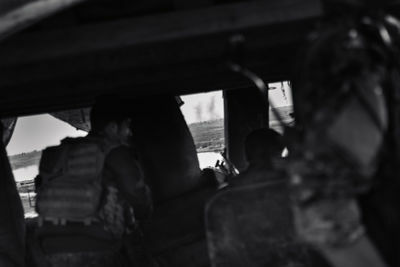 A few days ago we smuggled a group of people and they got caught, they started hitting them with the back of the rifle. You cannot pass through legally, so we are trying to smuggle them and people are paying everything they have to pass. What can I tell you, life here is very difficult. Al-Qamishli passage is closed, Derwaseya passage is closed, Ras al-Ain passage is closed. The other passages in Jarablos and Tel al-Abyad are open, even though they are under the control of ISIS. 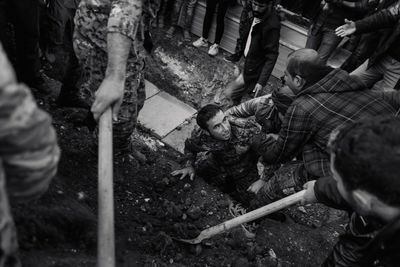 They closed these passages even though they help our brothers the Kurds. 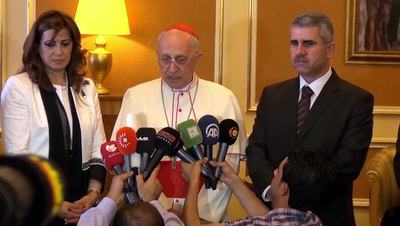 Cardinal Fernando Filoni has arrived in Erbil in Iraqi Kurdistan as the personal envoy of Pope Francis. Filoni i the former papal nuncio to Iraq and Jordan. Thousands of Christians fled to the Kurdish area as the Islamic State militia invaded towns and cities in northern Iraq. Cardinal Filoni is expected to deliver a personal message of solidarity and support from the pope as well as financial aid to those affected by the violence. After the city of Mosul fell under the control of the Sunni tribes and ISIS, Christians have become very afraid of what action ISIS might take against them. ISIS released a document stipulating that Christians in Mosul had three options, converting to Islam, paying a special tax, or being executed. Those who did not comply to the terms had to leave the newly formed ‘Islamic State’ and all their possessions were confiscated by ISIS. 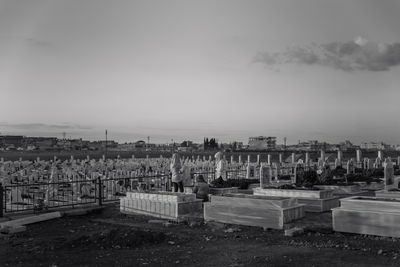 Almost all of the Christian community fled the city in terror and travelled to Erbil and Duhook where they slept in churches. The video shows two cars carrying a family that arrived from Mosul today after passing through an ISIS checkpoint where their money, jewellery, and car were taken from them. Abu Youssef, the first speaker, explains their trip from Mosul. However he, along with the priest, refused to appear in front of the camera out of fear that they would killed should they ever return to the city. They were also afraid that their homes in Mosul would be destroyed or burned down if they were seen on camera saying negative things about ISIS. Due to security reasons, we were not allowed to film the hall on the lower level, where families are staying, or where the kitchen and sleeping spaces are. However, we were allowed to take footage of one room that included a family with special needs (disabilities) and to meet with them and ask them about their situation in their new home. Iraqi soldiers on the border with Saudi Arabia take security precautions because of strange behavior seen on the Saudi side of the border. They believe ISIS are preparing an attack. Iraqi soldiers hiding near the Al-Ukhaider Fortress, 50km south of Karbala, having been ordered to retreat from the Syrian border. On the way to supply the border patrol with aid, Sayed Mohammad al-Talkani, the representative of Muqtada al-Sadr, and Iraqi Member of Parliament, Fatm al Kreiti, found 2,500 soldiers sheltering in the archaeological site. They lacked food and water; many of them suffered from starvation and some had become sick and died. When asked why they retreated they said that they received orders from the officers, with no reason given, to abandon their posts and were told to leave the border open for ISIL to enter and seize the abandoned weapons left there. 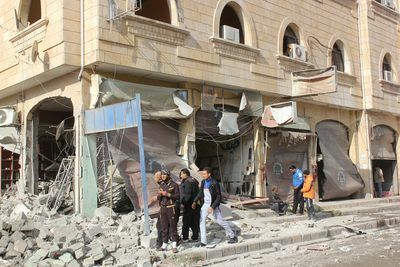 After bombings in Qaraqosh, the Iraqi government has decided to evacuate the entire town. 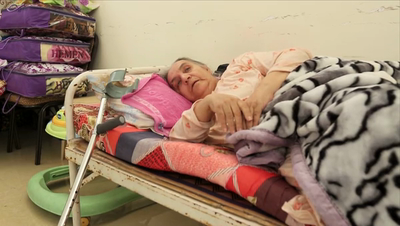 About 5,000 families have taken refuge in the city of Erbil, where schools and sports centers have been made available by local volunteers and aid organizations. A major city for Christians in Iraq, Qaraqosh fell to ISIS shortly after the latter's conquest of Mosul. Residents of Qaraqosh were reportedly terrorized by ISIS, who took Sharia law into their own hands, lashing one man for selling cigarettes, and killing several women found guilty of adultery. The city later suffered heavy bombardment during fighting between ISIS fighters and the Kurdish Peshmerga forces. Smuggled footage shows daily life under the rule of the Al-Qaeda inspired Islamic State in Iraq and the Levant (ISIL) in the north-central Syrian city of Raqqa. Included in the footage are shots of ISIL fighters, forced public prayer, foreign wives of ISIL fighters, ISIL women carrying guns, enforcement of strict dress codes for women, food handout stations, and testimony from locals about life under ISIL. Raghad, a young Syrian woman, left her hometown of Raqqa to finish her studies when the Free Syrian Army was in control of the city. However, she decided to return to see what had changed after the extremist Islamic State in Iraq and the Levant (ISIL) took over the city located on the Euphrates River in north-central Syria. 00:13 – 00:48 Raghad is stopped in the park by ISIS fighters in a truck telling her that her niqab is transparent. ISIS fighter in the truck: (3:33 – How are you leaving the house like this. We can see your face. Raghad: 3:37 – Really? Maybe it is a bit transparent. Forgive me. ISIS fighter: 3:40 – God does not accept that. 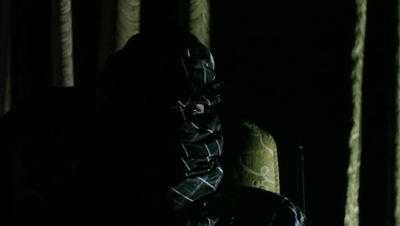 00:58 – 1:17 Raghad asks a women sitting in the park with her son and another man, if she thinks her niqab is transparent. Raghad: 00:58 – I left the house and I am not sure if my niqab is transparent. Is it? 00:10 Is my face showing? 1:30 – 1: 55 Street scene and armed fighter talking to children. The armed fighter than joins a street prayer. 2:46 – 6:17 Raghad is in a collective taxi at an ISIS checkpoint. There is an incident with the fighter at the checkpoint. ISIL check point officer: (4:47) You don’t fear God? Raghad: (4:50) Why, (4:57) what did we do to say that we don’t fear God? ISIL check point officer: (4:57)That woman only put on the Niqab a few meters before reaching the checkpoint. Raghad: (5:01)You think that whoever wears the Niqab will keep wearing it everywhere? Raghad: (5:05) No it’s not true. No woman will wear the niqab forever. Why do you think women are wearing the niqab in Raqqa? People wear it only in Raqqa. (5:20 – 5:25) Each person should be responsible to practice his religion (the way he or she wants). People are wearing the niqab out of fear. The other woman talking: (5:26 – 5:35) Some people wear it out of fear from god and others wear it out of fear for people. 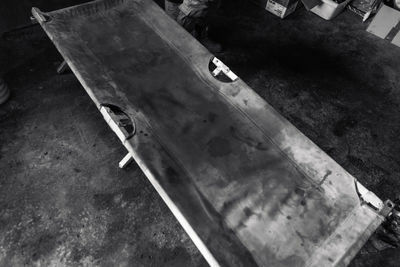 The other woman talking: (5:39 –5:55) The woman was wearing the niqab all the time but right before we arrived to the checkpoint, she couldn’t breath, so we lifted it a bit so that she could breath. She is newly pregnant and she wasn’t feeling well. 9:05 – 13:13 A public kitchen where women and children come to get food. Raghad talks to a woman and a child. Raghad: 9:09 Hello, what’s in your bowl? Raghad: 9:14 From the public kitchen? Woman: Yes, there is also bourghoul. Raghad: Is it like this every day? Raghad: (10:42) What is this? Raghad: (10:52) So you get food from here and you take it home in the buckets? Little girl: (10:55) No we come here put food in them and eat the food here then we go home and take the buckets empty. (11:05) Why are you asking? Raghad: (11:06) I just saw all of these crowds, so I wanted to know why they’re gathered here. 13:28 – 14:23 At a street market. We can see the place where they execute people in the back. 16:15 – 16: 31 I don’t want to come back… Because I am happy here. If I want to come back I can. I don’t want to come back. I am happy here. 16:44 – 16:50 We have everything here. I can assure you. There is everything here. 17:38 – 18:00 I am not planning on coming back. I’m telling you “cash” (she means straight forward) I don’t want her to tell herself that I will come back because I won’t. I came here, I didn’t take the risk to come here to go back to France. 28:04 – 28:53 – A woman holding a Kalashnikov with her son and a man enter a park. She is the same woman as the one sitting in the park, at the beginning of the video.